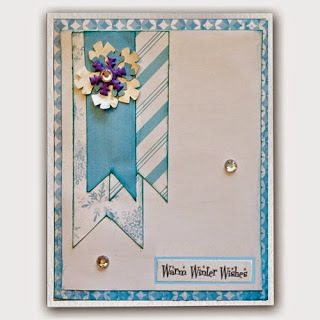 Blog Quick Quotes: January Club Q Cards with Donna! January Club Q Cards with Donna! Hi everyone, Donna here with two cards I made using the January Club Q kit. I LOVED this kit, the colors and the papers were so delicous, and I made a few adorable layouts but wanted to use up the rest of it. So I gathered up all the papers, ribbons, bling and set out to make some cards. I had some embossed snowflakes that I did not use from a previous layout I did, so that made a good starting point. 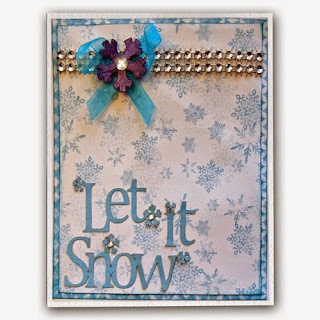 I got out my Quick Quotes Powderpuff inks to put on the edges of the paper and inked up the saying "Let it Snow" that was also in the kit. These two cards were a great way to us my scraps and now I have a couple of cards to send to my friends up north. Brrr! beautiful way to use scraps! these turned out great! !